Ares welcomes DTI Paris correspondent Christina Mackenzie. This post accompanies a gallery of 15 photos from the visit. The thwap of helicopters maneuvering above the 22,000-ton, 199-meter (653-ft.) Mistral landing helicopter dock accompanies our short trip from the beach, squashed aboard a landing craft with two of the Foreign Legion's 2nd Infantry regiment's armoured vehicles and a number of legionnaires. We slip easily inside the ship's well in a haze of blue smoke left by the vehicles as they come up the back ramp (there are also lateral ramps). The well can accommodate two landing craft air cushions (LCACs) “although France doesn't have any, but for interoperability reasons we had to be able to take them,” explains Captain Gilles Humeau, our easy-going, humourous host for the day. He welcomes us aboard the BPC (bâtiment de protection et de commandement) which he jokes also can stand for bâtiment pas cher: inexpensive vessel). 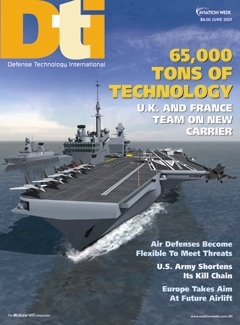 The BPC program for the Mistral and its identical-twin Tonnerre, currently on its first sea trials, cost "just" 685 million euros ($929.7 million) -- roughly the price the U.S. Navy pays for a single LPD-17 ship. 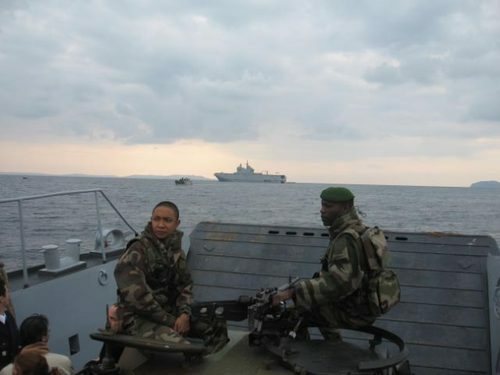 The French Navy received the ship in March 2006 and, although now operational, it is still undergoing sea-trials, put off schedule because it was used to evacuate 1,000 civilians from the cross fire between the Israeli army and Hezbollah in July 2006. The ship's NATO level 3 hospital (the only other one in Europe is German), full for this operation, was eerily quiet the day we visited. Spread over three levels and equipped with an NBC (nuclear, biological, chemical) decontamination unit, the hospital has 69 beds (50 for intensive care), two operating theatres which can function simultaneously, a dental unit (doctor plays dentist on this ship) and can send X-rays, electro-cardiogrammes, etc. to land-based hospitals by internet. But medicine is not its main mission. “This ship doesn't have one,” explains Humeau. “It's a juxtaposition of different platforms: the Swiss army knife of French naval forces,” he laughs. It also transports equipment, helicopters and a large-scale command centre. “There's a lot of room, in large part thanks to its outboard electric podded propulsors which frees up a phenomenal amount of space on board because there is no need for propeller shafts, there are only electric cables,” Humeau says. The wide corridors are sparsely populated. There are only 160 crew. “Admiral Fitzgerald, commander of the US 2nd fleet, told me he would have put 500 on board,” smiles Humeau. And if the Australian navy were to procure the ship, they would put 1,000 (including embarked troops) on board. Thus the crew can enjoy levels of comfort found on passenger liners. The 15 officers each have their own spacious cabin with a built-in desk and in-suite bathroom. Sailors are four to a cabin. Conditions for embarked troops are comparatively spartan “but we are more comfortable here than in our barracks,” says Foreign Legion Lt Jean-Pierre Royet who shares a cabin with his deputy, while four senior petty officers share another and the soldiers are six to a cabin.